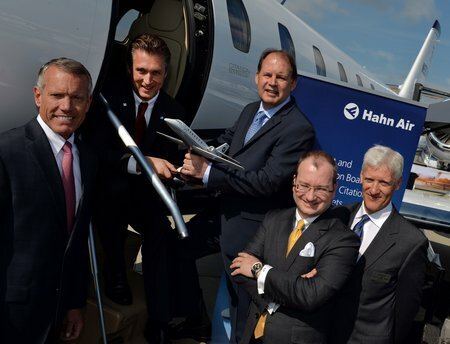 GENEVA (May 25, 2016) – Cessna Aircraft Company, a subsidiary of Textron Aviation Inc., a Textron Inc. (NYSE:TXT) company, today celebrates Hahn Air’s addition of a Citation Sovereign at the European Business Aviation Convention and Exhibition (EBACE) in Geneva. Through an exclusively Citation operated fleet, Hahn Air provides domestic and international scheduled and charter flights from Germany. Hahn Air will take delivery of the Sovereign in June after the completion of select upgrades at Textron Aviation’s Wichita Service Center. The aircraft received avionics upgrades, an interior refurbishment and customized paint scheme to match Hahn Air’s existing fleet of two Citation CJ4s and a Citation Sovereign.